There’s sometimes a need to closely examine the blood vessels that surround the spinal cord. One way to do this is with a diagnostic test called a spinal angiogram, which involves the use of an X-ray to observe arteries and veins. It’s often performed to look for either problems with blood vessels or a suspected vascular tumor. The process is a bit more involved than a standard X-ray but still very useful for diagnostic and, in some cases, treatment purposes. Here’s what you need to know about spinal angiograms. The test usually takes place in a room specially equipped with a machine that takes X-ray images of spinal blood vessels. A contrast dye, injected through a catheter inserted through a small incision in the leg, makes blood vessels visible on the X-ray images. Images captured at several different angles are displayed on screens and recorded for further review. Sedation medications are used to increase patient comfort. • Catheter insertion allows for viewing only specific blood vessels that need to be examined. • Because a catheter is used, a blood vessel stent can be inserted if it’s discovered that the affected blood vessel(s) is too narrow. • This is the only non-invasive procedure that can be used to provide very detailed images of blood vessels around the spine. 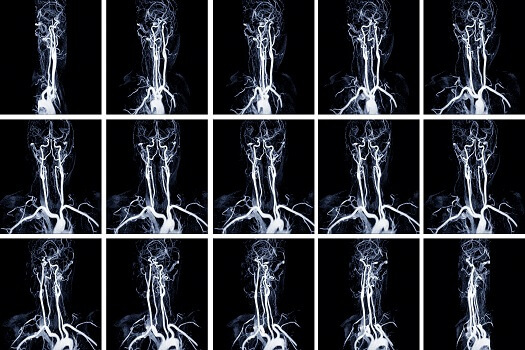 • Many different potential problems can be detected with this procedure—including spinal cord vascular malformations, bleeding, vessel hardening, and issues with narrow or wide (dilated) blood vessels. Be aware that complications or unexpected issues associated with a spinal angiogram are rare. In fact, a review of approximately 300 patient records of individuals who had spinal angiograms found that the procedure was “safe and effective.” Also, precautions are typically taken during the test to further reduce risks. Ultimately, the information a spinal angiogram can provide generally outweighs any risks that might be associated with the procedure. Minimally invasive tests such as a spinal angiogram can be extremely useful in diagnosing a wide variety of spine-related issues, and doctors often use the results to guide their recommendations about treatment, which may eventually include a surgical procedure such as coflex back surgery. Los Angeles residents who experience prolonged, sudden, or severe pain in the neck or back should reach out to the spinal health experts at The Spine Institute. Our pioneering physicians and innovative treatment methods put us at the forefront of the spinal health industry. Give us a call today at 310-828-7757 to schedule a consultation.